Have you ever tasted the delights of a Special Geisha? Well, me neither, so I woke up today all happy, feeling like I was a child again and it was Christmas morning; bursting with anticipation and excitement. 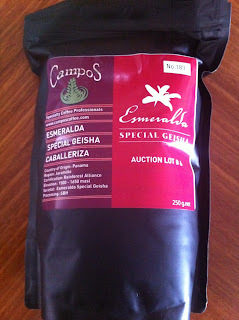 Esmeralda, my exotic mail-order Panamanian Special Geisha, was arriving this morning. Hailing from the Jaramillo region, some 1,500-1,650 metres above sea level, she even came with a certification of quality from the Rainforest Alliance. While I waited, I busied myself with making Esmeralda's new home presentable - I gave Miss Silva a good back-flushing and topped her up with fresh water, cleaned out the grinder and wiped down the bench top. At around mid-morning, the Express Post delivery man dropped off Esmeralda at my front door - nestled in a little cardboard box for protection during her flight from Sydney. Finally! Esmeralda's heady scent just made me want to keep inhaling it: dark, rich cocoa with some ephemeral candy-like notes. Eventually, I had to bite the bullet and put Esmeralda through her paces with Miss Silvia. The first taste of this sweet nectar had to be perfect, so I didn't take any chances, pre-heating a cup with hot water and then temperature-surfing Miss Silvia to get it hot and heavy. Ground reasonably fine - with a setting of 5 on my Sunbeam Cafe Series grinder - in an 18g double-basket with a light but firm tamp, making the cup of espresso was a joy to behold. Thick, oily nodules of dark, glistening liquor began to drip slowly out of the twin fonts of the portafilter 5 seconds after I switched on the water, and when I switched it off at the 25th second, the cup contained a perfect compact shot of beautifully rich, dark espresso, swirling with flavoursome and aromatic oils and sporting minute bubbles testifying to the freshness of the roast. The coffee was delicious - a rich cocoa nose with slight florals ("florals, WTF?" you ask? Yes I kid you not! ), followed by a seamless, smooth and sublime taste experience of fresh, bright flavours: my favourite citrus notes in the forefront but not overpowering; a soft, slightly sweet back note; both of which were bridged by a creamy, rich coffee flavour (it is coffee after all!) accompanied by hints of caramel. After the finished cup had been sitting on the counter for an hour, I couldn't help myself and had to have a sniff - it was surprisingly sweet: the caramel was dominant now, akin to the smell of brown coffee crystals. In case you were wondering, no I don't have sugar in my coffee - it interferes with the complex flavours and there is enough innate sweetness in good coffee anyway. 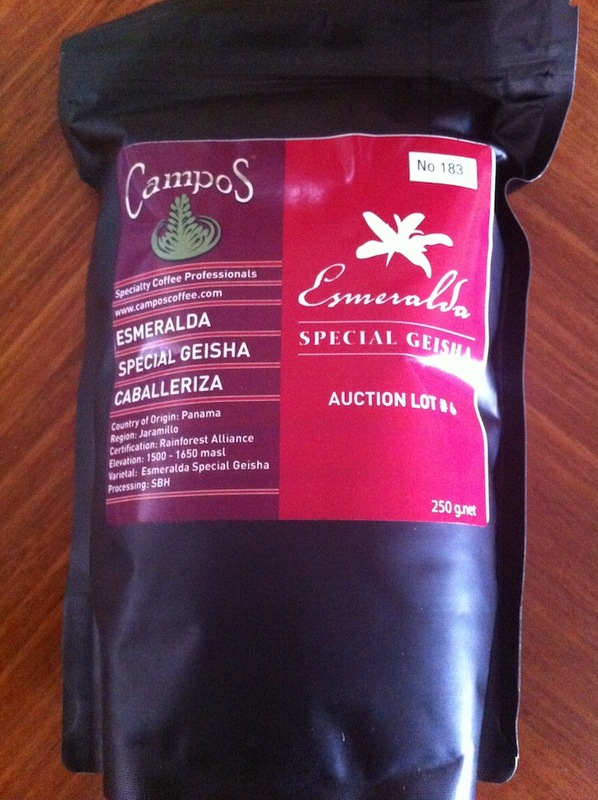 Esmeralda Geisha - one of the most hyped-up coffees of the 21st century. Oliver Strand of the New York Times' T Magazine Ristretto blog describes it as the Domaine de la Romanée-Conti of coffee. Ah yes pinot - another one of my loves. Also with those beautiful candy-caramel notes in the bouquet and flavour. But I digress. 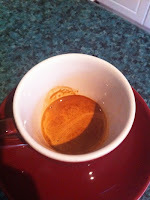 I discovered this coffee on the Campos Coffee website last week. Normally, I refuse to buy coffee beans online, because no website ever guarantees the freshness of the roast, or tells you when the beans have been roasted (more than 3-4 weeks old and the oils start to dry out, leaving a hollow, one-dimensional shadow of the freshly-roasted version). With the Geisha, it's different. They roast a new batch every Thursday to fill orders on hand, and then express post it out within hours of roasting. Being on the other side of the country, I didn't expect to receive my Geisha on Friday, but my hopes were rewarded when it turned up on Monday, 4 days after roasting, a perfect time to start savouring the coffee and to track the evolution of its flavours over the next week or so. Just checked out the Proud Mary website - it looks great! As for the Collingwood neighbourhood ... my good friend the Loco Cabron would love it!